HERTALAN® was the first in Europe to develop EPDM membranes long before the creation of the modern day bituminous roofing products. We put EPDM on the market as (amongst others) a roofing material. Pioneering runs in the blood of our company not only regarding our products and systems, but also with regard to the ever-changing market. HERTALAN® has years of expertise in the UK building construction market and we are keen to share our information with you. HERTALAN® has its own R & D department (with certified laboratory), our own rubber technologists and extensive experience in the market for roofing materials (since mid-60s). Most of our knowledge is available in our installation guidelines and technical bulletins which will assist you in choosing a suitable roofing system for your project. This information is available in the downloads section of this site which is accessible with a login code. Please contact us if you require a login code. As a central contact point, HERTALAN® offers a full service package. Not only on the performance level but also in cost control for clients or in advising architects and specifiers. Over and above this we are familiar with the demands and wishes of divergent customers. We stand for results, with leading products and offer a complete service from design through to completion of the project. HERTALAN® is originated in Holland. This is our stable operation base towards the (inter)national market. Hertalan EPDM systems are an investment in the future, based on proven quality. HERTALAN® provides professional transfer of knowledge with certified EPDM products out of an organisation where quality and environmental management are highly appreciated. HERTALAN® ISO 9001 and 14001 certified and our quality statements are laid down in KOMO, ATG and BBA certificates. High failure costs are a problem for the entire construction industry. Yet there is among different parties in the construction a disagreement about the origins of failure costs. According to the developers it is created mainly by errors in the design and preparation. Solutions are being sought by all parties to better communication. CCM has valuable knowledge and a wide range of experience. As part of Carlisle® Construction Materials we have access to resources which remain closed for other companies. We are present in the building chain, from the first idea to the installation of our materials and we are also able to promote integration and links with other associated companies. From reference lists of the participating elastomer EPDM producers SKZ selected 39 roofing projects in Germany, Austria, the Netherlands and Sweden, from late 90s ranging in age and installed between 1968 and 1996. From the samples taken, the mechanical properties were determined, such as hardness, tensile strength and elongation at break. On all roofs that were investigated, the EPDM roofing materials fulfill its function as waterproof membranes completely, the samples were visually no serious aging visible. 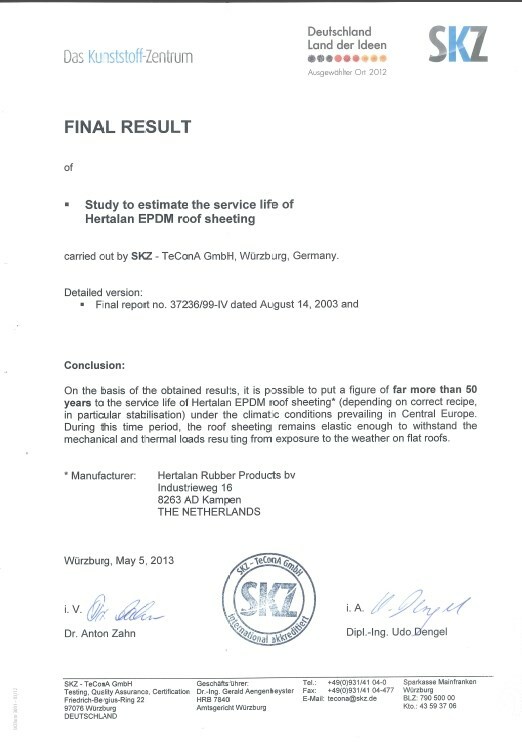 Final Outcome is based on the useful life HERTALAN® EPDM roofing> 50 years. If you have any further questions please contact us. This is very easy using the form below.